Organizational dynamics includes the culture, structure and people. There are three distinct types of organization culture: learning, bureaucratic and rules-based. innovates speedily enough to adapt to changing environments. maintains a culture that supports continuous learning principles, which frequently involves critical thinking, and risk taking. are more tolerant of errors in judgment or process, understanding that systems and people will be challenged. becomes educated through their meaningful experiences, benchmarking, networking and collaboration. reviews the skills, knowledge and abilities of its members to support change and transformation ongoing. monitors the processes, policies, practices, procedures, data, and information that support decision making. converges people and system resources in the DIKD continuum., which in part determines its maturity level. Click here for more information on the learning organization. mandates Good Manufacturing Practices (GMPs), Good Clinical Practices GCPs, Good Laboratory Practices (GLPs), etc. There are basically four structures that pertain to perceived power of the project manager with respects to utilization of resources and authority level. 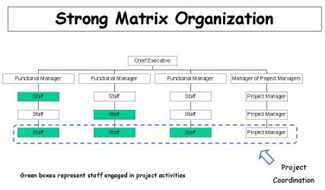 Strong Matrix: Project Managers have more authority than Functional Managers. Balanced Matrix: Project Managers share authority with Functional Managers. Weak Matrix: Project Managers have less authority than Functional Managers. Projectized: Project managers have full authority. Note: Functional managers are departmental in scope, i.e., Sales, Marketing, Human Resources, Customer Service, etc.